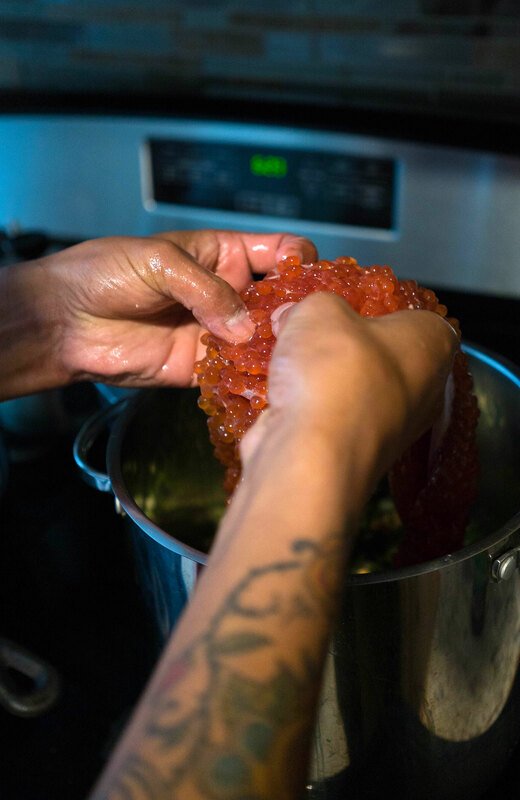 Warren Jones carefully lays out the ingredients for his family’s fish head soup, a recipe he’s adapted and changed throughout his life. Ginger, miso, bok choy, celery, noodles, seaweed, tofu, and salmon eggs surround the two fresh king salmon heads that stain his white cutting board light orange. Warren chops and dices in his kitchen while his two older kids scurry in and out of the house. His baby crawls happily around the living room; his middle child pops in briefly to jokingly feed crackers to the fish heads. Warren and his wife live in a blue house that sits on the edge of a suburb in southwest Anchorage. Through the woods, at the end of the street, Campbell Creek feeds into Turnagain Arm keeping Warren’s relation to the sea and the fish it provides close by. "My great grandfather grew up in a much different world, he never tried Asian food and certainly didn't have the luxury of picking up miso and noodles at Fred Meyer. I like to think if he was born into the world I was, he wouldn't live much differently." 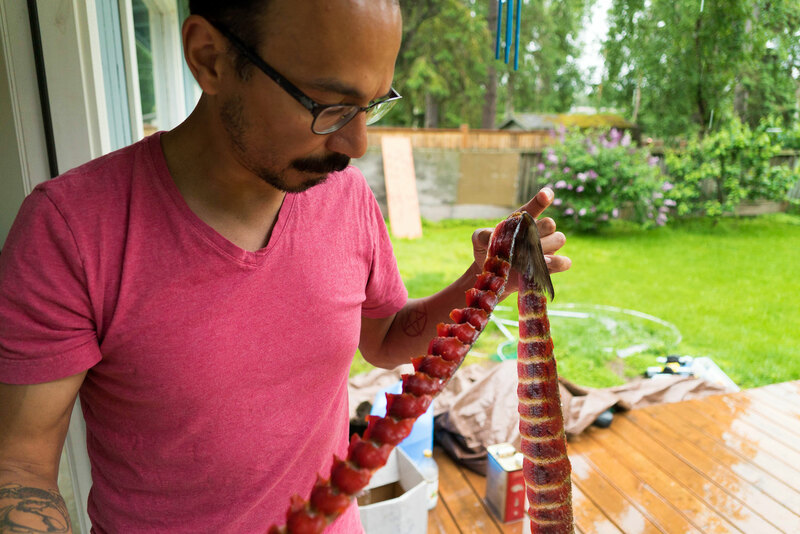 Warren is a stay-at-home father and philosopher, and was recently selected as an Alaska Salmon Fellow. 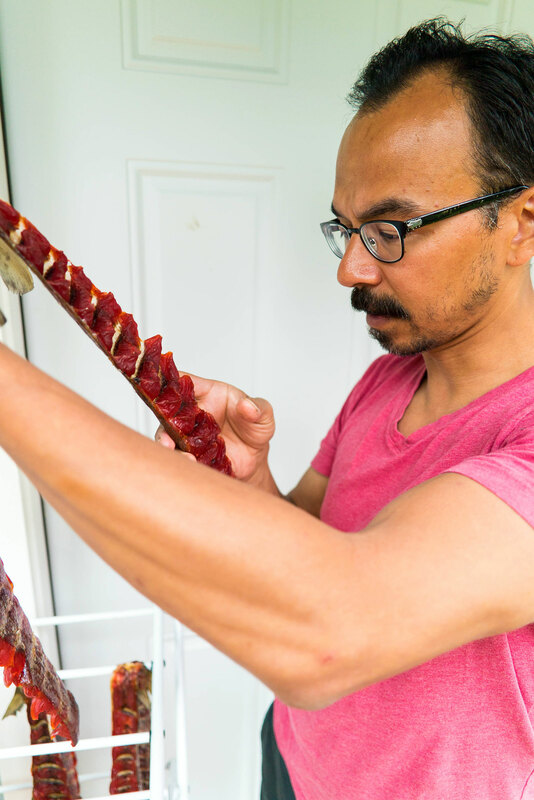 While he has worked as a commercial fisherman and as a fishmonger at Pike Place Market in Seattle, his connection to salmon comes from gillnetting off the coast of Nome with his family. 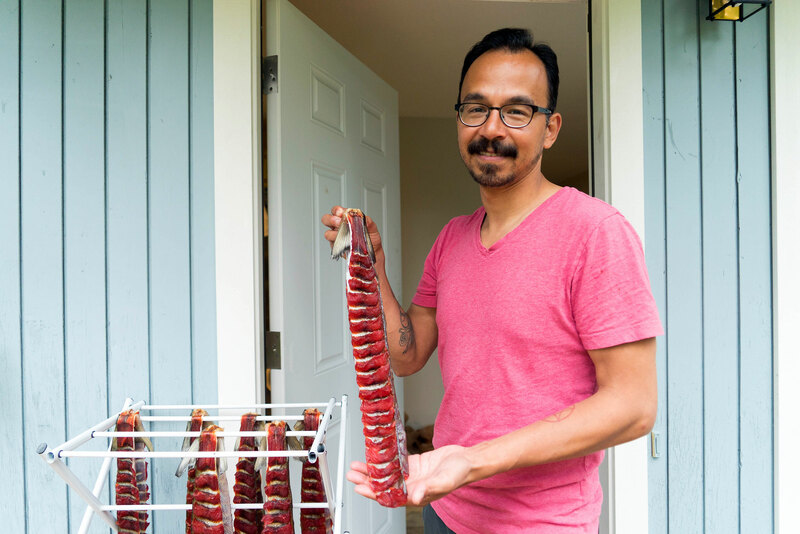 There, among the chilly waters of the Bering Sea and the arctic landscape, his family instilled his Native values, emphasizing the importance of salmon and what it means to live a healthy life as an Alaskan. “Our culture and identity were born there,” explains Warren, who identifies as Yup’ik, Gwich’in, and Inupiaq. 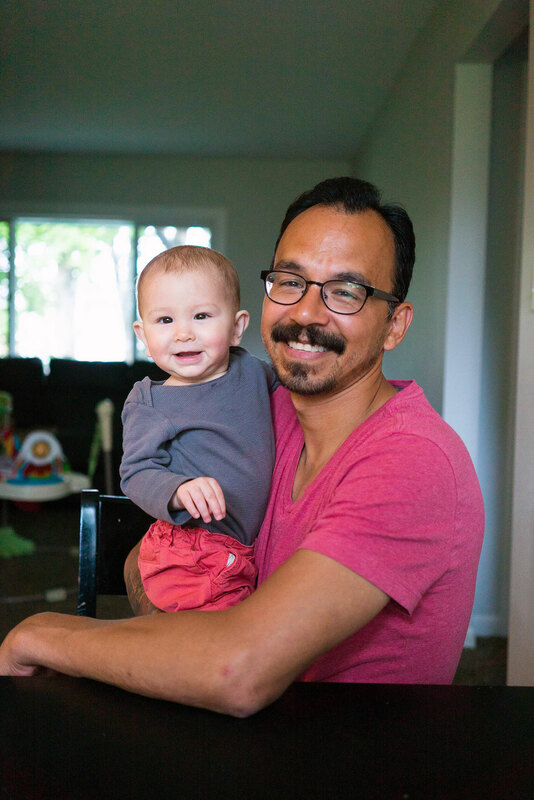 “The lessons the environment has to teach a person are hard ones, but are worth learning.” While his family hails from Hooper Bay, Warren, whose Yup’ik name is Maaruk, was raised in Nome and moved to Palmer in the sixth grade. Now, he sport fishes and dipnets the Copper River for salmon every year to feed his own family. While the water is different, the lessons are the same. Today, his family awaits his catch in the form of soup. Warren holds the king salmon heads under a steady stream of water, rinsing their silver sheen in his slate gray sink. He confidently drags his knife along the fish as he’s done this hundreds of times before. Warren details his belief that survival and resiliency in harsh environments are the defining elements of Yup’ik and other circumpolar north cultures, and Arctic Nations. He has come to call this belief The Philosophy of the Circumpolar North or Northern Philosophy. This theme of strength plays throughout Warren’s life and inspires his current work. As a young man, Warren served as an infantry scout in the United States Marine Corps. During his service, he saw that shared purpose and camaraderie between men were critical to staying healthy and working through individual and group challenges. The bonds and space created reminded him of the traditional men’s house in Yup’ik communities. In its prime, the men’s house was a central social, political, spiritual, and economic institution that was a defining aspect of Yup’ik way of life. Today, he is working to reintroduce the men’s house to at least one Yup’ik community. Although the project is still in the beginning stages, Warren has a clear vision for strengthening the gap between his heritage and the modern world. Warren makes his way out the back door, checking to see if the drizzling rain has disturbed the salmon he is drying out back. The fleshy strips of fire-orange meat are hanging between two backyard trees. 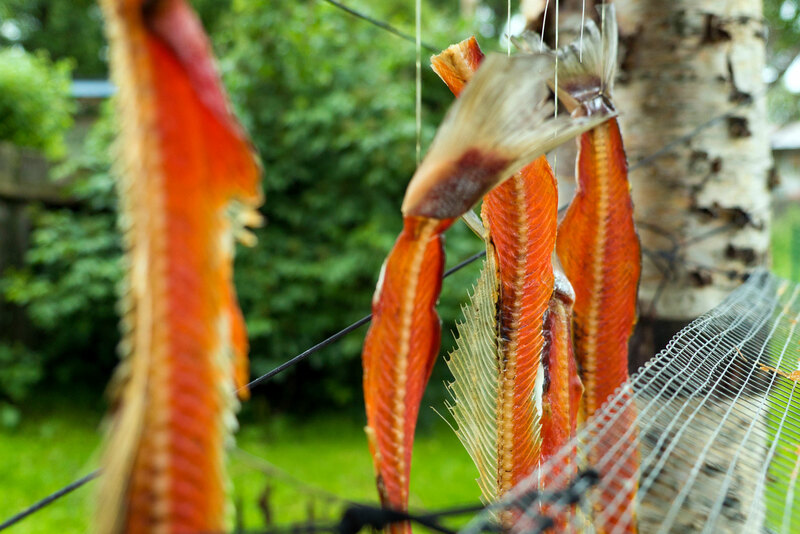 The dense foliage above shield the drying salmon from the Alaskan environment, and what doesn’t fit under the protective branches, Warren drapes across the top of a clothes drying rack sheltered beneath the eave of his roof. He inspects the strips, testing dryness and making sure there are no flies. 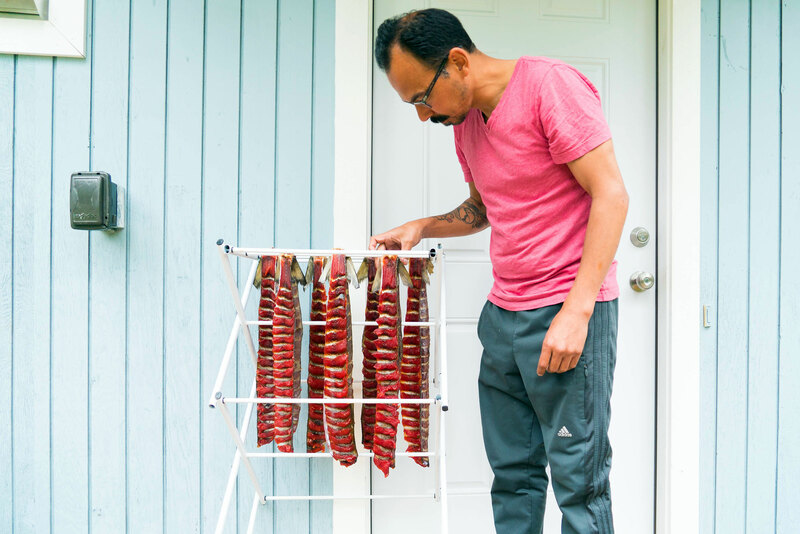 He stands back to admire his handiwork and explains, “[Fish drying] is just something I do on the side to keep me busy; it’s fun experimenting.” Warren is no stranger to experimenting and embracing the circumstances of modern life — after all, he is drying fish in his backyard in Anchorage. 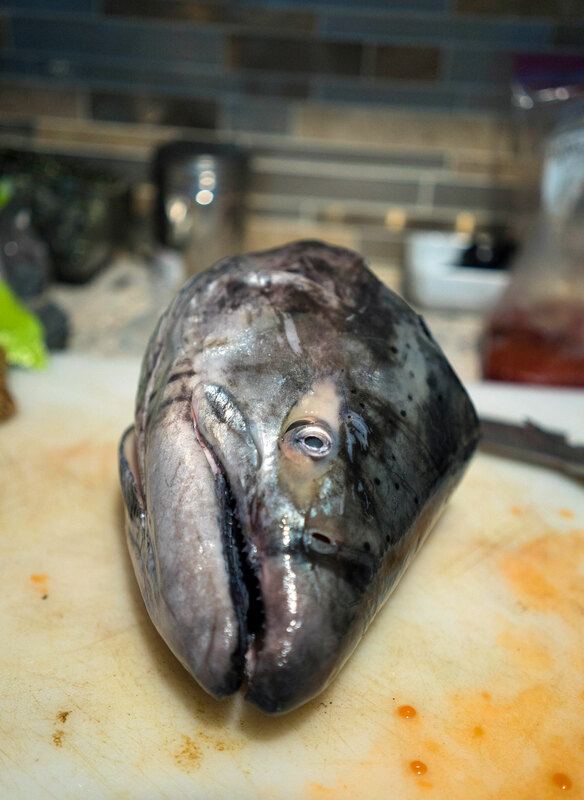 Back inside, Warren pulls the salmon heads from the soup pot, picking them clean of the meat, the cheeks, and the eyes, which he adds back to the soup before serving it up. 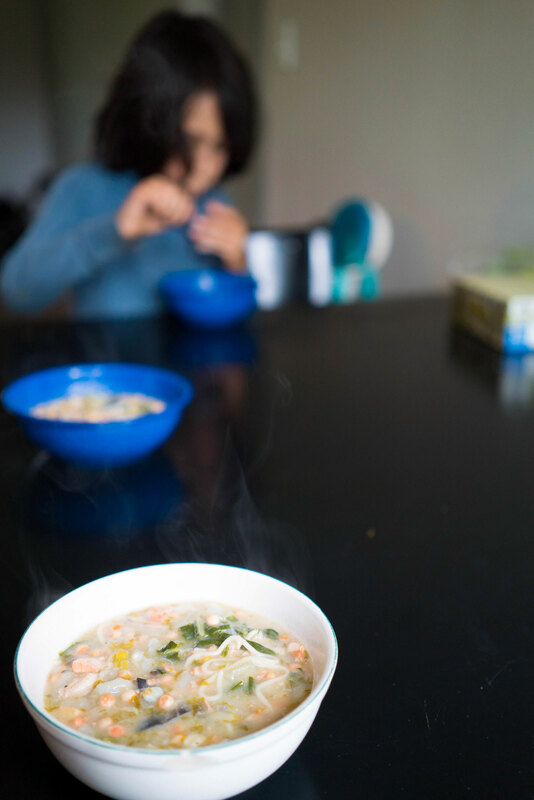 He pulls blue and white bowls from his cupboard, and prepares to dish up his soup. His children stop through the kitchen amidst neighborhood play, another generation ready to indulge in the mouth-watering Yup’ik meal. The kids eat quickly to get back to playing. With little room for breath, their bowls are empty, their seats vacant, and their stomachs fueled to go back outside into the summer evening. 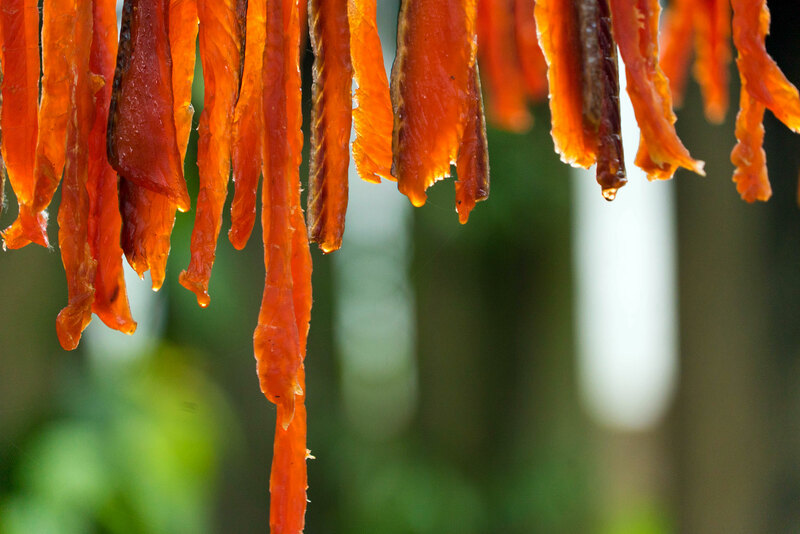 To Warren, salmon are more than just an ingredient in soup. They are a staple, a way to feed his family. They are a symbol of both his past and his future. 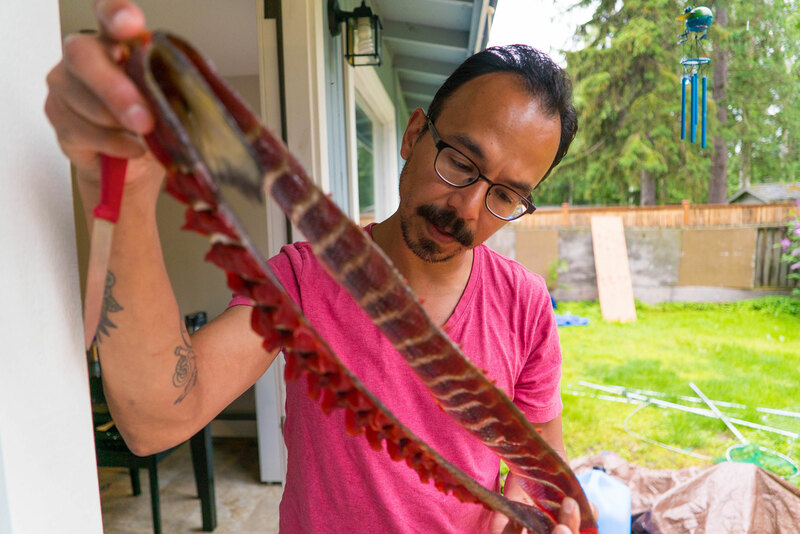 Salmon are delicately woven into the traditions of his Yup’ik heritage, and as an Alaskan, he longs to protect that for the future generations. He notes that healthy native communities mean a healthy Alaska, and a healthy Alaska means healthy fisheries. 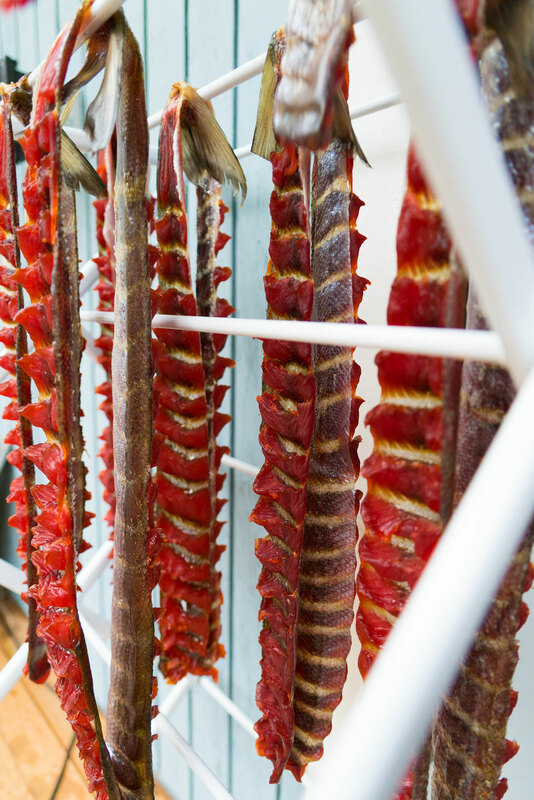 Preserving salmon life is to preserve tradition and to ensure a future. It means being able to string up the flesh of freshly caught salmon in your backyard and to add miso to a traditional salmon head soup. Lee is an adventure-seeking photographer, videographer, and writer sharing stories with heart. He lives in Southeast Alaska.